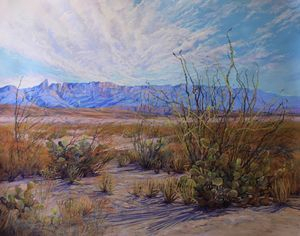 Two decades of copiloting a corporate jet gave the eclectic native West Texan landscape painter a profound understanding of the dramatic skies she portrays. Lindy’s mother taught her to draw, and Albert Handell introduced her to pastels, but her degree is in English and Biology (Texas Tech 1972). She has always painted professionally, but with little formal art training. She holds a 4th degree black belt in taekwondo, and credits martial arts for a body/mind/spirit connection that carries over into painting. In 2004, she and her corporate pilot husband, Jim went middle-aged crazy, sold their Lubbock home, quit their jobs and struck out in their RV in search of adventure. 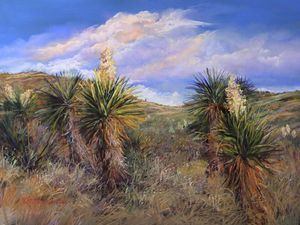 Now she paints on locations throughout the Big Bend, and maintains a studio on a Davis Mountain heritage ranch. 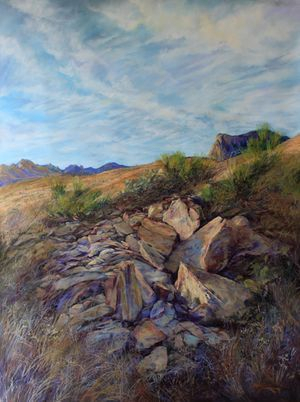 Lindy is represented by Midland Gallery, Midland TX; Michael Duty Fine Art, Dallas; The Open Range, Alpine, TX; Gallery at Fort Davis Drugstore, Fort Davis, and her own Old Spanish Trail Studio 20 miles SW of Fort Davis, open for studio gallery visits by appointment. The Hotel Limpia (Fort Davis), The Gage Hotel (Marathon, TX), Front Street Books (Alpine, TX) carry Lindy’s enhanced prints and fine art cards. 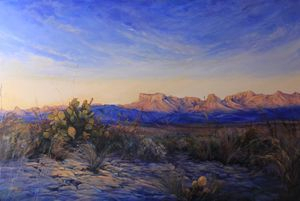 Lindy is one of the artists at The Museum of the Big Bend’s annual western art invitational show, Trappings of Texas, and a featured artist at the annual Dallas Heritage Village Art on Main Street exhibit of Texas landscape paintings.